Neck liposuction is typically performed under sedation. The small incisions are hidden behind the ears and within the natural crease under the chin. Dr. Harirchian uses small cannulas to remove fat from under the chin or along the jawline. This recontours the neck and chin area, creating a smooth jawline and eliminating a double chin. A healthy amount of fat underneath the skin imparts a look of youth, so it is imperative not to be overaggressive with neck liposuction. 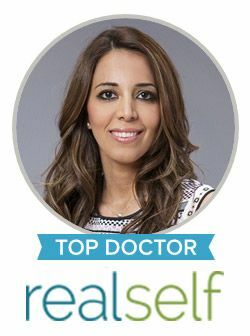 Who is a Candidate for Neck Liposuction? Surgery on the face & neck can address different issues including fat (either superficial or deep to the platysma muscle), loose muscle (platysmal banding) and/or loose skin. The ideal surgery to address neck complaints depends on your age and the exact cause of your neck complaints. The best candidates for neck liposuction are young patients with excess neck fat who have otherwise firm neck muscle and skin. Older patients can also benefit from neck liposuction if they want a limited procedure with less downtime and quicker recovery, however it will not address loose muscle or skin. Loose skin or muscle in the neck is best corrected with either a necklift or facelift. Contact our office today to schedule a consultation with Dr. Harirchian about a neck liposuction procedure. This 37 year old patient had a persistent bulge underneath the chin. Dr Harirchian performed neck liposuction with improvement in neck contour.